Dorie is a quilt maker, quilt teacher and pattern designer from Folsom, CA. She has been sewing since she was nine years old and has been quilting since 1984. With her practical approach to quilting and her extensive experience, Dorie has been instrumental in introducing many new and traditional quilters to the unlimited potential of quilt piecing and design. 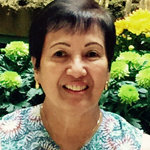 "My students know me as an enthusiastic and patient teacher, one who encourages trying new techniques and expanding their repertoire of skills." In the classroom, Dories’ students are treated to the specific techniques involved in their class, and also to precision piecing tricks as well as efficient shortcuts which help to streamline the pleasures of quilt making. Dorie loves the concept of using basic geometric shapes to produce an infinite variety of designs. She also likes the idea of using her favorite Asian/Oriental fabrics together with other blenders that makes her quilts exquisite and one of the kind.